Cosmetic bonding is an affordable, quick, painless way to repair many cosmetic flaws or injuries. If you have chipped teeth, gaps between your teeth, or stains that cannot be removed by whitening, cosmetic bonding might be a great option for you. Dental bonding reshapes individual teeth without requiring removal of tooth structure. This technique bonds a composite material to the tooth that looks, acts and feels like the real thing. This procedure usually does not require the use of an anesthetic and is relatively quick to apply. 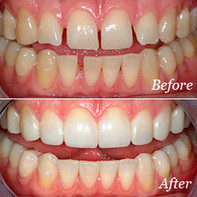 The result is immediate and less expensive than veneers.